by following The Word of Wisdom. This is a three-fold mission...eat meat sparingly, use the grains/crops of the field as our staff of life, use herbs more effectively. My church has a health code called The Word of Wisdom. Mormons are famous for abstaining from coffee/tea, alcohol, tobacco and other illicit drugs. However, what is less commonly known, and much less commonly practiced is the entire other portion of the health code. The Word of Wisdom is much more than this basic level of "shall nots." "Yea flesh also of beasts and of the fowls of the air, I, the Lord, have ordained for the use of man with thanksgiving; nevertheless they are to be used sparingly...only in times of winter, or or cold, or famine...All grains are ordained for the use of man...to be the staff of life... as also that which yieldeth fruit, whether in the ground or above...All wholesome herbs God hath ordained for the use of man." Eat no Meat. Okay...so I know I already do this, but my family doesn't. 1-2 times a week is our new standard. I am excited for the adventure. I admit a definite advantage having been a vegetarian for almost 20 years. Don't think I am committing my children to vegetarianism...I will let them decide at a more accountable age. To aid in my quest I have 2 secret weapons. Secret Weapon One: A Brand New Pressure Cooker! Think beans in 30-60 minutes. Miraculous. No soaking. I will be searching for fabulous bean recipes. If you have any please share. The best recipes come from friends and family. Say Good Bye to Cereal. I am slowly working to wean my family off of cold cereal. Grapenuts excluded (which btw I have a great homemade version I will share sometime). The rest...too many ingredients. Emmett, Callista and Brent are on board. Ellery is my trickiest conquest. 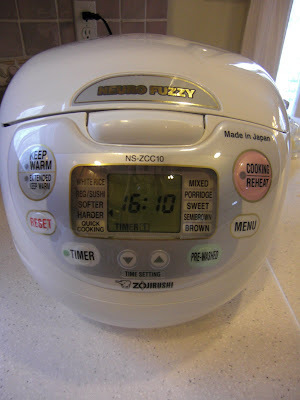 Secret Weapon Two: A Brand New Rice Cooker! Think waking up to perfect chewy mulitgrain cereal every morning. 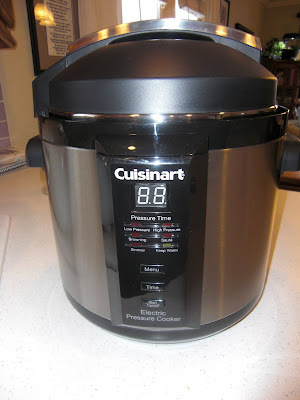 I have a fabulous recipe and the best cooker on the market. (If you haven't guessed it already, this was the holiday/birthday season of appliances for me.) My amazing sister Charlotte introduced me to the joys of the pressure and rice cookers. I am still learning. Finally, to utilize the herbs God has ordained for our health I have a fancy new tool. 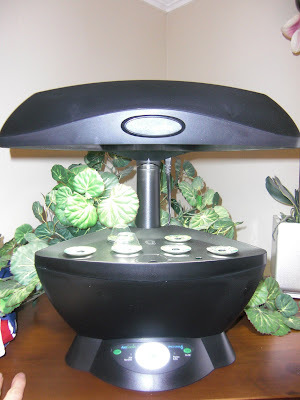 Secret Weapon Three: My Brand New Aerogarden! This nifty little device should provide me fresh herbs year round. I don't know anyone who has used this. I actually saw an add for it in the Bed Bath and Beyond mailer. I asked my mom for it for my birthday. I was ecstatic to receive it. Brent was ready to buy 4 more, he thought it was so amazing. He wants them in every room of the house. I was able to hold him off until we give this first one a shot. I love fresh herbs and can't wait to see if this works. After 5 days I already have mint, oregano, basil, dill, chives and thyme sprouted. Rebecca, Happy Birthday. Cool planter. I can't wait to hear about it! Does it water for you or something? I just made a giant batch of Veggie soup in my pressure cooker. It really is great. I sauted my carrots, onion, and celery in it first, added a little dried mustard, salt, pepper, and then some beef broth, Worstchestchire saucem 2 potatoes and a bay leaf. Voila! Pressure 5 minutes, and now it sits @ 200* until right before we eat I add a little cream and shredded cheddar cheese. It smells great and is so much healthier than a crock.